A creamy and tart, yet sweet key lime pie pop! Just ike eating a key lime pie, in pop form! 1. Bake key lime bars according to directions. Allow to slightly cool. 2. Place key lime filling, crust, and whipped topping in a large bowl. Using an electric mixer, mix on high speed until mixture is thick and creamy. Chill mixture 1-2 hours. 3. Melt Vanilla CANDIQUIK® in Melt and Make Microwaveable Tray™ according to the package directions. 4. Spoon a small amount of CANDIQUIK® into the candy mold, pushing it up the sides to completely coat the inside (but leaving enough room for your key lime mixture). Allow to set. 5. Once coating inside the mold is set, spoon key lime mixture into the mold, filling to the top. Immediately spoon more CANDIQUIK® on top, smoothing to the sides of the mold so the key lime mixture is completely covered. 6. Before coating sets, insert lollipop stick in the middle of the mold and softly push down. 7. Place candy mold in refrigerator to set. 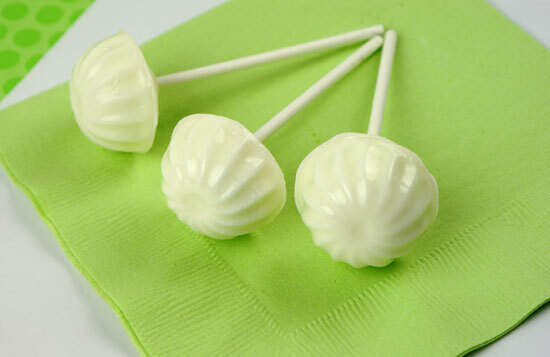 Once completely set, gently remove key lime pops out of the candy mold.